Disclosure: This post is sponsored by Airheads. All opinions are my own. I've always loved Airheads Candy growing up. I liked biting into them and ripping them apart to eat them. I definitely distinctly remember them a lot during Halloween time! Well even today, Airheads are still a beloved candy brand and are taking things to the next level. They are looking for Airheads! Now before you get offended, let me explain. 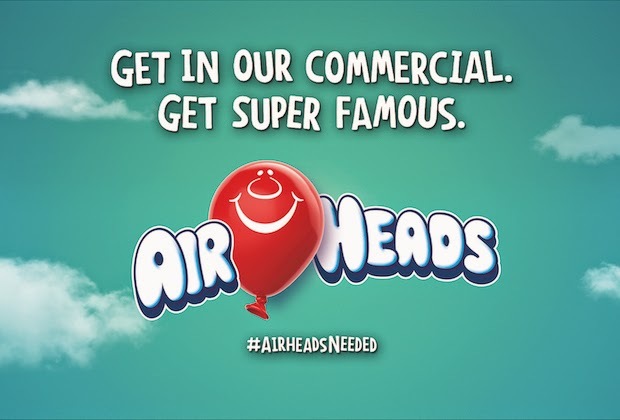 Airheads wants to showcase life's mishaps and "airhead" moments and showcase them through their campaign that they recently launched, "The World Needs More Airheads." They are looking for fans like you to post a Vine, Insta-vid, Youtube video, anything that shows your airhead moment! All videos submitted will be featured on their site, and if you have one of the top 3 videos, you can be featured in an Airheads tv commercial! Upload a Vine, Insta-vid, or Youtube video of your airhead moment. Visit the Airheads Tumblr to submit your video for a chance to win. Your video can be one that you recorded a long time ago, or it could be one that you just created! Keep an eye out for my Youtube channel for my entry. You know I can't pass up an opportunity like this! Show me your Airhead moment! I've definitely had my share of 'airhead' moments! Airheads are so yummy, I'm thinking about entering this!